The colors on the map show the current air quality in each area according to the table below. To get real-time data from our network of air monitors, click here. You can also find more information on current air quality conditions in Louisville on airnow.gov. The Air Quality Index (AQI) tells how clean or polluted your outdoor air is, and what associated health effects might be a concern for you. 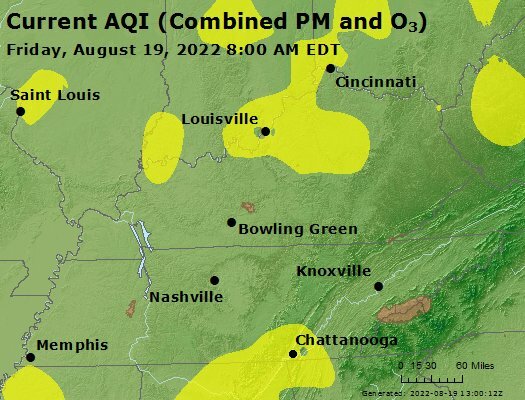 The EPA calculates the AQI for five major air pollutants regulated by the Clean Air Act, but the primary focus in Kentuckiana is ground-level ozone (O3) and particle pollution (PM2.5). APCD uses the current conditions along with meteorological data to forecast air quality as far as four days ahead. See the air quality forecasts page for more information on this topic.